Soldiers dig foxholes on the front line of the battlefield to take shelter when the enemy is attacking at full force. When my four-month-old son suffered a non-accidental traumatic brain injury nearly a decade ago, I fell face-first into the dirt of my own foxhole. Curled up so tight that I could feel my own breath, I had two choices: either bury myself deeper or look up, find a sliver of light and pray it was God, willing to save my son – and me. With nearly microscopic faith, I called out to the God I had stiff-armed my entire adult life. What happens next is revealed in Faithful. 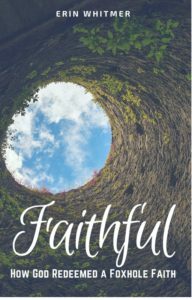 Featuring the raw prose of a memoir and woven with biblical teaching, Faithful carries the reader through a discovery of redemption and evolutionary faith, culminating in a reminder that no matter the foxhole we find ourselves in, He is faithful.